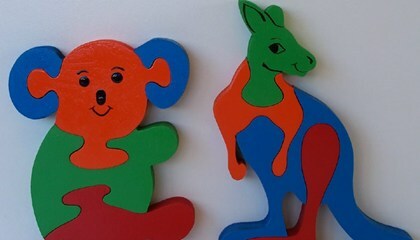 Welcome to our large range of colourful vibrant puzzles, all our puzzles are skillfully made by us in Bendigo using only top quality materials. 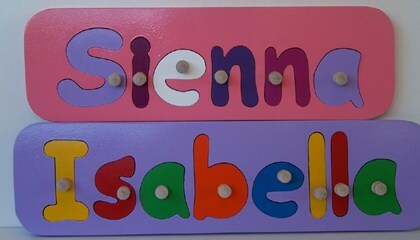 Peg Boards: In this category we have our range of peg board names, they are available in a variety of colours. 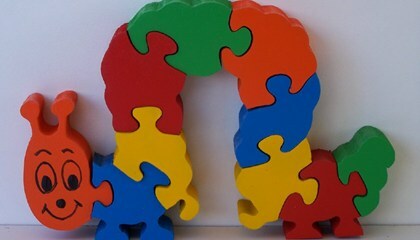 Interlocking names: We make a range of letters which interlock allowing the child to build his or her name. 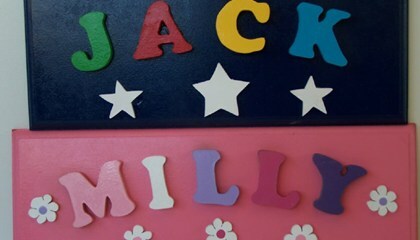 Door Plaques: Our Door Plaques will make your childs room complete, we can make a plaque to exactly suit your child. Great gift ideas for birthdays, Christmas and special occassions. Jigsaw Puzzles: Our range of jigsaw puzzles is extensive, if there's something special you would like, drop me an email and I will see if i can make it for you. Please visit our website and online store to see more of our exciting range.